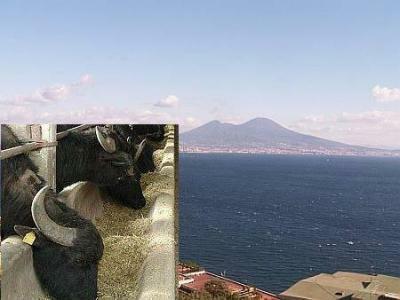 How did bubalus bubalis get to Naples? Some sources say that the Goths brought them from the north during the invasions following the fall of the Roman empire. (Those sources don't explain how northern Europeans got Asian water buffaloes in the first place.) Also, say some, perhaps the Crusaders brought them back from the Middle East. (That is unlikely since the animals were in Italy before the Crusades.) The chronology of the domestication of the animal speaks for itself. The Asian water buffalo is a domesticated variation of the Bubalus arnee, the wild buffalo of the Indus valley, where they were first tamed for agriculture before 2500 B.C. ; thus, they were present in the famous Harappa Indus valley civilization of the Indian subcontinent and then spread west shortly thereafter to Mesopotamia during the period of the Akkadian dynasty. In light of that, the most commonly accepted explanation for their presence in Italy is relatively straightforward: Arab/Islamic colonizers and traders found the buffalo as they moved east in the 600s and then introduced it in the west in North Africa and Sicily. From there the animals spread to the Italian mainland at various Arab enclaves in the south. The Arabs brought with them the art of making dairy products from buffalo milk and imparted that art to the natives (captured Benedictine monks, according to some sources). The tradition of making mozzarella became firmly entrenched and stayed even after the Arabs lost their footholds on the southern mainland and eventually lost Sicily, itself, to the Normans in the 1000s. Sources document the presence of producers of mozzarella in the area of Aversa, the initial Norman holding in the south, as early as the 11th century. After that, the tradition of mozzarella in Campania is solidly established. There is some confusion in distinguishing mozzarella and fior di latte, a cheese made from cow's milk. Mozzarella is made only from buffalo milk. That confusion exists elsewhere, but not in Campania or anywhere in southern Italy. That is, they—who know the difference—might try to sell you a pizza with cheese made from pasteurized cow's milk, but they know they shouldn't. A real Neapolitan pizza has to be made with real Campanian mozzarella as defined by the law governing foodstuffs of Denominazione di origine controllata (DOC)—Protected Geographical Status. There is, in fact, a consortium responsible for the "protection, surveillance, promotion and marketing" of the Buffalo Cheese of Campania. Finally, although I have used it here, the term "mozzarella cheese" makes no sense in Italian. You either want mozzarella or cheese. It can't be both. That would be as confusing as, well, bubalus bubalis, and we don't want that. Also, the term mozzarella comes from the verb mozzare, meaning "to break off" and refers to a step in the shaping of the finished product. It does NOT mean "cut" and it's not cheese, so you can forget that joke you've just been dying to blurt out, you vulgarian, you.